You know working out is good for you. You’ve heard it before. Sweating every day can lead to a longer life. But here’s something you may not know: According to researchers, working out may slow (and in some cases reverse) the signs of aging at a cellular level. 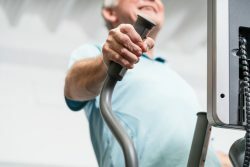 In a controlled study, researchers found that High-Intensity Interval Training (or HIIT) may increase cells’ ability to take in oxygen and produce energy for particular age groups. These cells tend to deteriorate with age, so the increase in oxygen intake and energy production were noted by the researchers to having a reversal effect on many age-related changes. So, what is HIIT? It’s a training method wherein periods of highly intensive intervals of training are alternated with less intensive intervals. Here are three examples of HIIT that you can do on your own to begin your anti-aging exercise routine. Of course, before you try any new workout, be sure to check with your doctor to ensure it’s right for you. Warm Up: A light walk on the treadmill until you’re feeling limber and loose, but not tired. High-Intensity: Sprint or modified jog (at a pace you’re most comfortable with) for 20-25 seconds. Lower-Intensity: Slow to a brisk walk for 90-100 seconds. Repeat: Do this 3-5 times. Cool Down: Walk for a few minutes at a casual pace until you feel comfortable. Warm Up: A light cycle for a few minutes, until your muscles feel loose. High-Intensity: Cycle at a quicker pace that you’re comfortable with for 20-25 seconds. Lower-Intensity: Slow to a brisk pace for 90-100 seconds. Cool Down: Cycle for a few more minutes at a light pace, then walk for a couple more minutes at a casual pace until you feel comfortable. Warm Up: Spend several minutes using your favorite stroke at a leisurely pace. High-Intensity: Using your favorite stroke, perform one lap as quickly as possible. Lower-Intensity: Using your favorite stroke, perform one lap slowly. Cool Down: Do a few more laps with whatever stroke you like at a slower pace, allowing your body to recover. Are you ready to try HIIT? Keep in mind that, as you get more comfortable with HIIT, you can apply the same high-intensity/low-intensity method to strength-building workouts as well (but, again, talk to your physician first). Here’s a good reason to get started as soon as possible: A study at the Boston University School of Medicine found that people who exercise regularly in the middle of their life have greater brain health in their senior years than those who do not. Enjoy your new anti-aging workout and the results that come with it!